Log scaling is the determination of the gross and net volume of logs. 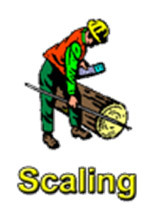 The primary purpose of scaling is to determine the volume by product or species that will be charged at a predetermined rate (i.e., to estimate the amount of lumber that can be sawed from logs of different sizes), also known as "scaling for payment." Conventional scaling entails measuring log diameters and lengths and applying an approved set of rules to deduct for defects. This process is used to determine the gross and net volume of a given number of logs (generally log truck loads). Scaling is typically performed on unloaded logs at the mill site by an experienced forest technician. As mentioned in the previous section, the Forest Products Measurement Group supports and maintains the FSscaler field data collection software. This mobile application is a moderately complex program that guides users as they enter data into a hand-held field data recorder. The application consists of several screens that enable the user to enter log data, such as length, diameter (small and large end), and defects. The program then automatically calculates log volume and can generate various summary reports. The FSscaler application is designed to be intuitive, fast, stable, and customizable. The typical field data recorder-of-choice is Juniper System's rugged Allegro MX because the button keypad allows for easier data entry than touch screen data entry. From the state-of-the-technology investigation performed during Phase I, SDTDC was aware that Vangard Voice Systems had developed software specifically designed to voice-activate mobile devices. In summer 2011, SDTDC contracted Vangard Voice Systems to participate in this proof-of-concept study to use their AccuSpeechMobile software to voice-enable the FSscaler application. The process of voice-activating the FSscaler application (so that it could run on the Allegro MX) was a lengthy, iterative process that involved close coordination with a programmer from Vangard Voice and the Forest Service programmer/forester with the Forest Measurement Group (Matt Oberle). Vangard's AccuSpeechMobile software can work on any mobile computer that operates using Windows Mobile CE 5.0 or greater. The software operates by inserting commands "non-invasively" within the source code of the application (i.e., with a few changes within the source code that are easily identifiable and removable, if necessary). In that way the application itself is unaffected. This process creates a voice-enabling development environment that serves as a voice-enabling platform for analysis, design, and voice-engineering. AccuSpeechMobile software allows developers to create (on the mobile device itself) a voice-model or grammar file that represents the data entry, function controls, and grammars (vocabularies) that are required by the mobile application. The voice-enabling process provides the user the ability to substitute voice commands (Speech-to-Text and Text-to-Speech) for key strokes and provides the necessary functions for orchestrating operations with the application. It bears repeating that all computing is done on the device itself. The "speech engine" on the mobile device can, therefore, continue to operate untethered without any kind of connection to a server. The length of the voice-activation process can be lengthy or short-depending on how much (or little) the user wants to command-and-control the device by voice commands. If the user wants the device to prompt the user with vocal directions, to recognize a wide variety of data inputs, to repeat the user's data entry submissions (and thereby reduce the likelihood of data entry error), or otherwise orchestrate operation of the application, this requires more time-consuming programming and testing. Obviously, more voice command-and-control demands more programming effort. We opted for a limited amount of command-and-control of the application and voice input confirmation (i.e., device repeats data input by user). The technical document for the voice-activation of the FSscaler application provides more details of how the voice commands ("grammars") command-and-control the application. The only significant obstacle we encountered during the voice-activation process occurred when we discovered that the Allegro MX (field data recorder) did not support a microphone/headset. The Allegro MX had USB ports that allow audio output but does not have a software (device) driver that allows the device to accept audio input from a microphone with a USB attachment. As such, SDTDC modified Vanguard's contract to direct them to develop a software driver to allow a USB headset/microphone to be connected to the Allegro MX to allow audio input. For this study, we used the Jabra GN2000 headset (mono/noise cancelling). Matt Oberle (our Forest Measurement Group Partner) tested the application in the office setting to make sure the voice-activated FSscaler application operated in a reasonably efficient manner. After some back-and-forth modifications with Vangard Voice, Matt enlisted the assistance of a FSscaler application super-user (Chuck Morris - Forestry Technician, Black Hills National Forest, Northern Hills Ranger District) to conduct a field test. Chuck Morris tested the voice-enabled field data recorder in a log yard in May 2012 on a typical warm sunny day with moderate wind. The field data recorder would not allow for voice recognition under actual, outdoor field conditions. In a moderately noisy setting (of wind and background noise), recognition of voice commands was impossible or full of errors, and, as such, the field tester considered that using voice to command-and-control the FSscaler application on a field data recorder was impracticable. Matt Oberle summarized the results of the field testing of the FSscaler application in a memo dated May 22, 2012. Vangard Voice provided input to Matt's May 22, 2012 memo.